Gurudwara: 8 a.m. till 8 p.m. daily; 15302 Morris Bridge Road, Thonotosassa, FL 33592; (813) 986-6205. HINDU SOCIETY OF CENTRAL FLORIDA, 8:30 a.m. to noon and 5 p.m. to 8:30 p.m. Monday through Friday; 8:30 a.m. to 8:30 p.m. Saturday and Sunday; 1994 Lake Drive, Casselberry, FL 32707; (407) 699-5277. Rishi Visvamitra was greeted by King Dasaratha with great reverence and an offer to request for anything he wished; stating that fulfilling his request would be his duty and joy. Visvamitra asked for the King’s son, Rama, to help him vanquish some demons bent on disrupting an important Yajna that he was conducting. The King was shaken to the core as his attachment to Rama was beyond his own breath and exclaimed his disbelief at the request. Before the situation where ‘word given’ could worsen, Rishi Vasistha, the family Guru intervened and comforted the King with the wisdom of permitting Rama to accompany Visvamitra to fulfill the promise already given. The chamberlain who was asked by the King to send for Rama sadly told the King that Rama’s condition was worsening by the day. Though a Prince, he lived in the Palace in austerity, rejecting all comforts and princely pleasures. Rama would spend most of his day in quiet contemplation; uttering sentences on the futility of pleasures and the traps of comforts. He shunned all lavish conveniences and would spend his days in this state. Seeing him in this pitiable condition, his dear brothers also followed suit as their love for Rama was beyond all. The Sage Visvamitra intervened as the perplexity of the King grew and assured the King that there must surely be a cause for the effect. He felt a state of dispassion was overtaking Rama and this needed to be examined and resolved. Rishi Vasistha agreed and Rama was being sent for, he appeared in the court to pay his respects to his father and the sages present. Though all were delighted to see Prince Rama, he carried a different demeanor in his mannerisms and looked like a person lost in deep thought. When questioned by Rishi Visvamitra regarding his present condition, Rama replied that a train of thought had overtaken him since returning from his year long journey beyond the walls of the palace and he was unable to reconcile what he had seen with the discipline of teachings he was given. The two sages present in the court knew immediately that Rama’s condition of dispassion was an indication of the dawning of wisdom and there was a need to offer clarification and confirmation to the doubts of Rama, there and then. Life is not a smooth blend of events offered to us for our personal enjoyment and sense gratification; it is a stream of opposition, seeming contradiction and rough edges, which will persistently confront us for a response and ‘do something or not do something — we must’. Rama’s story in the Yoga Vasistha is not a story of a long time ago; it is our story even today as at every moment, we too are brought face to face with our understanding of the world at large. We think before we act and hence when cornered with opposition continually, we are not afforded the complacence of an adopted value system and forced to re-evaluate things as our old ways of thinking and envisioning provides viable solutions. We will continue on Rama’s response in regards to his condition to the wise sages in the next issue. Swami Suryadevananda, presently residing in St. Petersburg, is with the Divine Life Society founded by Sri Swami Sivananda in Rishikesh, India. He can be reached via e-mail at suryadevananda@gmail.com. About 1,500 people attended the grand opening ceremonies of the Swaminarayan Temple from June 29-July 3 in Lakeland. It was the first U.S. PranPratishtha by recently inaugurated His Holiness Acharya Maharaj Koshalendraprasadji of Ahmedabad who attended all five days of ceremonies. Among the 13 idols installed in the temple were Harikrishna Maharaj, Radha Krishna Maharaj, Hanuman, Ganesh and also a representation of Shreenathji for the Vaishnav followers. Yogendra Bhatt presented a five-day Bhagvat Katha, combining the complex concepts of Shreemad Bhagvat with everyday concerns of people by using large doses of humor. HHAM and Sant Mandal Shobhayatra presided from a specially designed parade float. Devotees sang songs and lit fireworks. Ishwar Shukla, who was in technical charge of the Yagnabhumi, also handled the murti preparation. Assisting him were Nalin Joshi and Dhiren Shukla. Shah specially mentioned 40 youth, members of the Nar Narayan Dev Yuvak Mandal. “NNDYM is a pet project of His Holiness Acharya Maharaj Koshalendraprasadji who deeply believes in instilling in the younger generation the spiritual values we take for granted as the first generation of Indians in America,” he said. The temple is at 2798 New Tampa Highway in Lakeland. For more information, call Dilip Shah at (863) 647-2597 or the temple at (863) 687-4776. Acharya Mridul Krishnaji Goswami will present Bhagwat Saptah Aug. 21-27 at Sanatan Mandir (311 E. Palm Ave.) in Tampa. Swami Goswami was born in Vrindavan in the devout family of Swami Shri Haridas, guru of the famed classical maestro Tansen. 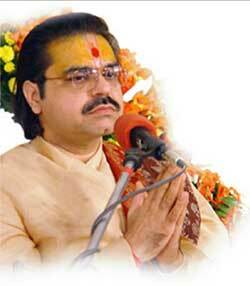 Swami Goswami has been preaching this divine scripture since the age of 16, and till date has completed more than 700 Bhagwat Kathas. For more information, call the Sanatan Mandir at (813) 221-4482.